Dividend Reinvestment Plans (DRIPs) are an appealing way to put your financial future on auto-pilot. And given that the number one reason by far that most people underperform the market is overtrading, anything you can do to take emotions out of financial decisions is often a very good thing. However, as with most things in the world of finance, the devil is in the details. Let’s look at six specific tips that DRIP investors need to keep in mind to best maximize the chances of meeting their long-term financial goals. The best thing about DRIP investing is that it’s a powerful tool that helps you to automate investing. Since the wealth and income compounding power of the stock market, which has generated 6.9% CAGR inflation-adjusted total returns since 1871, requires time and patience, DRIP investing can be thought of as the lazy (but very smart) person’s road to riches. Because DRIP investing is such a hands-off approach, it is best used for stocks that are of such high-quality and low risk that you don’t need to pay all that much attention to them. In other words, DRIP investing is best done with blue chip stocks, those companies with predictable businesses and wide competitive advantages that have proven themselves excellent wealth compounders over time. A popular place to start one’s search is with dividend aristocrats (25+ consecutive years of rising dividends). 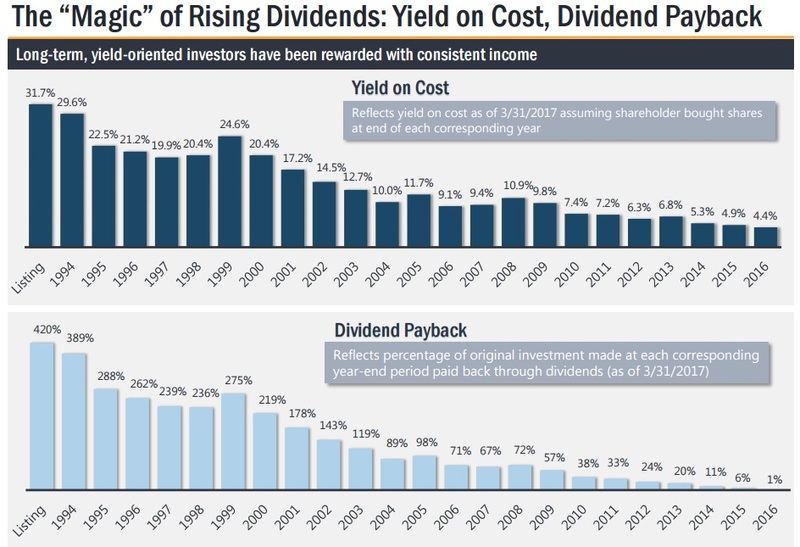 For those craving even more dependable dividends with relatively low risk, such as investors living off dividends during retirement, dividend kings (50+ years of consecutive dividend increases) and our list of high dividend stocks can make even better DRIP candidates. The key to all of these blue chip DRIP candidates is that most of them have proven themselves over decades. Each has steady cash flows to support growing dividends and a shareholder-friendly corporate culture that is dedicated to rewarding investors for their patience over time – no matter what the economy or stock market is doing in the short-term. DRIP investing won’t work if you don’t give your investments the time needed for the compounding power of rising dividend streams to work. That means you should only ever DRIP on shares owned in a long-term (10+ years) portfolio. And keep in mind that you will have to pay taxes on DRIPed dividends. For most blue chip stocks (basic corporations) that means qualified dividends, which are taxed at the capital gains rate (0%, 15%, or 20%). Owning these stocks in a tax-deferred account, such as an IRA or 401K, is an ideal solution to avoid these taxes until you start withdrawing required minimum distributions at the age of 70.5. Also keep in mind that owning dividend stocks on a DRIP plan can be a great way to match up your time horizons. After all, any money saved in an IRA or 401K can’t be removed without paying hefty fines until the age of 59.5. This can help you keep your eye on the prize and maintain your long-term discipline. However, when it comes to pass-through stocks such as REITs and MLPs, things can get a bit more complicated. There are two major benefits that DRIP investing can give you and that investors need to make the most of. First, is the power of exponentially growing dividends to help you achieve strong long-term returns. For example, let’s consider Realty Income (O), which is one of the best high yield monthly dividend stocks. Since its IPO, Realty Income has been growing its dividend by 4.7% per year, a rate which the company’s long growth runway should allow it to continue for the foreseeable future. However, while the 4.5% yield is what initially attracts income investors to the stock, as you can see the true power of this dividend growth legend comes to those that hold for the long-term. In fact, if you had bought Realty Income at the IPO, and never sold it, then your yield on cost (current dividend/cost basis) would be an astounding 31.7%. Meanwhile, if you had set up a DRIP to accumulate additional shares over time, then the dividend stream you would now enjoy would be enough to cover your initial investment more than fivefold, every single year. DRIP investing, with its focus on the long-term, is a reasonable way to keep your focus on the horizon and avoid the temptation to time the market or let short-term volatility scare you out of an excellent investment. The second big benefit to DRIP investing is that some stocks will actually allow you to buy discounted shares. For example, Enterprise Products Partners (EPD), one of the best midstream pipeline MLPs, offers 5% discounted units for DRIP participants. That is the equivalent of 5% free money, in the form of a growing number of units, each which has a growing income stream that can enhance your total returns over time. There are two main ways to set up a DRIP, through your broker or individually by company through a transfer agent such as Computershare, which many blue chip companies use for DRIP programs. However, the downside to such an approach is that you can get hit by fees, both onetime and ongoing. For example, as you can see below, using Computershare to set up a DRIP with Wal-Mart (WMT) involves numerous fees, including a very steep commission to sell your shares, $25.50. Instead, one of the best ways to DRIP is to do it through a DRIP-friendly discount broker such as TradeKing, Scottrade, TD-Ameritrade, or Vanguard. DRIP plans are essentially a way to automatically dollar cost average, meaning to invest a particular sum into a stock on a set schedule regardless of price. While DRIPs are a great choice for most investors, if for no other reason than it continuously puts your capital to work in the market, that doesn’t mean they are necessarily an optimal means of investing. That’s because valuation matters and even high-quality blue chip dividend growth stocks can run up and become overheated. Blindly DRIPing every stock virtually guarantees you will be purchasing some shares of overvalued companies, which increases risk of underperformance. Identifying fairly priced or even undervalued holdings to reinvest the dividends into instead would improve your portfolio’s long-term returns. Of course, most people don’t have a portfolio so large that any individual holding, especially one with a relatively low yield, would generate enough dividends each quarter to make such a targeted approach practical. Instead you would need to pool your dividends for a time (say a month or a quarter) and then redeploy that cash into whatever appears to be the most undervalued at the time (which is what Scottrade’s FRIP does). Investors pursuing such a strategy need to keep commission fees in mind, which is why such an approach will only work with a very low cost discount broker such as Robinhood (which offers unlimited commission free trades). In addition, this optimal value dividend growth approach also requires investors to put in the time and energy to track individual companies and select which are the most undervalued, something most people are simply too busy to do. Despite the allure of manually redirecting capital to the highest potential opportunities within my portfolio, my personal preference is to automatically reinvest dividends. It speeds up compounding, helps resist the temptation to time the market, and keeps a portfolio reasonably diversified over time. It is also surprisingly hard to know which of your holdings will go on to be the best long-term performers, further raising the challenge of deciding where to actively reinvest dividends. I prefer to maintain an equally-weighted portfolio for that reason as well – if nothing else, it protects me from myself! As you can see below, over the past two decades the stock market has remained the best performing asset class, yet the average investor has woefully underperformed. In today’s age of ever more popular and low cost exchange traded funds (ETFs), what explains the fact that most people’s portfolios haven’t even kept up with inflation? The answer is that, even in today’s golden age of high-quality market data, human nature is still getting the better of us. Emotions are causing most people to overtrade, including with low cost ETFs that track the broader market. This is understandable because over the last few decades psychologists have found that humans brains are naturally hardwired to feel the pain of losing $1 twice as much as the pleasure of gaining a $1 (an evolutionary benefit that is now working against us). As a result, people naturally attempt to minimize losses and essentially attempt to time the market. However, numerous studies over the last century have shown that market timing not only doesn’t work, but is the absolute worst thing you can do. For example, between 1930 and 2016 the S&P 500 generated a total return (including dividend reinvestment) of 10,055%. But missing out on just 85 of the market’s best days (which generally occurred around bear markets) would have reduced that performed to just 38%. In other words, market timing is the best way to ensure you waste the market’s wealth compounding power. Since DRIP investing is merely an automation tool that you generally set up through your broker, it can’t save you from yourself if you intentionally sabotage yourself through market timing and overtrading. In other words, DRIP investing only works over the long-term, which is why, as with dividend growth investing in general, what matters isn’t market timing but time in the market. Today is a true golden age for retail investors because there has never been an easier or more cost effective way for people to save and grow their wealth and income over time. That’s due to the plethora of quality research tools, low cost brokers, and ways of automating one’s long-term investment strategy. However, at the end of the day DRIP investing is just a tool and not a guaranteed way to riches or success. Like with all tools, what matters most is the person wielding it, which means learning to become disciplined and patient enough to allow the compounding power of the market to work for you. That being said, if you can create a long-term investing plan that suits your needs, risk profile, and time horizon, and most importantly, stick to it in good times and bad, then DRIP investing can be one of the best ways to reach your financial goals. Lots of great info – thanks. I use Computershare for a Custodian account for my 10-year old son – we use it to buy Dr. Pepper stock with money he earns from chores, etc. Computershare is a fine option for a very long buy-and-hold time horizon; otherwise, the selling fees are cost prohibitive. My personal accounts have grown to a level where I collect the dividends in cash and then buy an undervalued dividend stock of my own choosing (vs. automatic DRIP, which many brokers will do for free).